models greatly superior to other models. SolidWorks. The Ship is placed in the CAD System in full scale and then reduced to the intended scale. All technological features are then installed. (1) A full scale CAD Model of the four IOWA Class Battleships. (2) Static display model (1:32nd, 1:48th scale). (4) Physical model with remote operational features. (5) Floating telemetry controlled model with remote controlled operational features. They have great presence on the water. And react and execute verbal commands as the real ship would. The following is a projection and specifications of our current project. All features are created utilizing Stereolithography, this process offers great detail that would be difficult to make by hand or other processes. 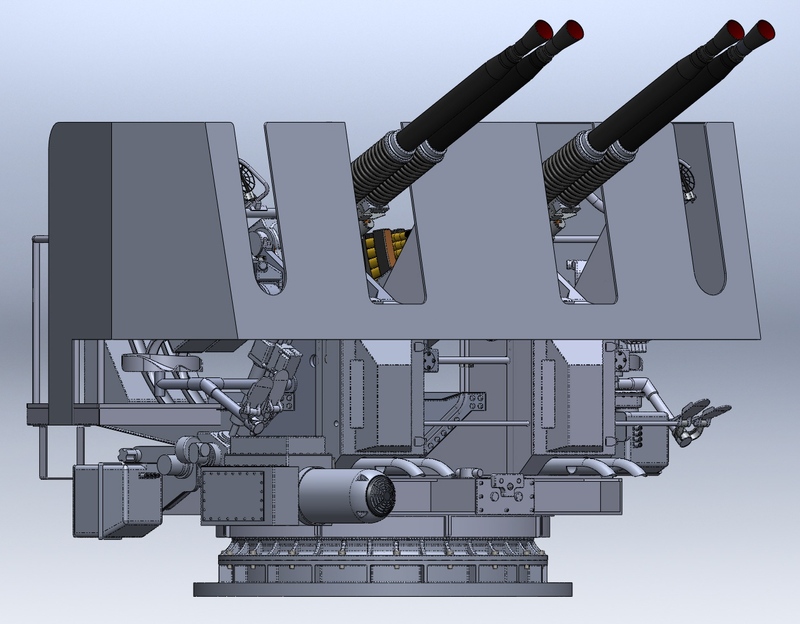 Below are pictures of a Quad 40mm Bofor Antiaircraft Gun. the IOWA Class Battleships mounted 20 of these during the Second World War. The first picture is a fully scaled CAD Model completed using SolidWorks Premium. It is approximately 90% complete at this stage of recreation. The second picture is the 1:32nd scale Stereolithic Model made by Dinsmore and Associates. As you will notice, the Stetreolithic Model mirrors the full scale CAD model with outstanding clarity.